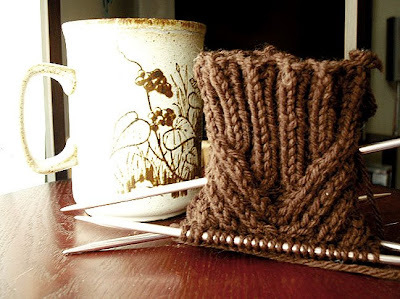 With school going full force, sometimes I need a bit of quality time with my knitting needles. 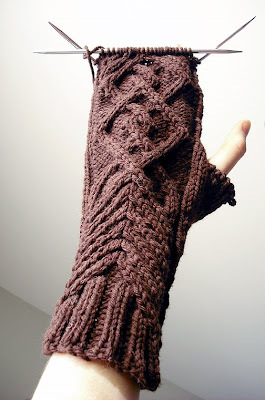 I've been pining after the Chevalier Mittens from Made by Myself for quite some time. I've also been trying to burn through some stash yarn, so this project was perfect for that lone skein of brown Cascade 220 that was taking up room in my closet. I started them in the morning, and got just past the cuff. A few episodes of Battlestar Galactica later and I'm almost finished with the first mitten. I really want to finish these so I can wear them. It is SO cold outside today! I love love love those mittens Cassie! So pretty and you've got the perfect yarn for it, can't wait to see them finished! Those are beautiful. I love the vees on the wrist. you're a nut. your mittens are crazy awesome. we have to find some time for you to teach me to knit so that I can keep myself warm next winter. Cassie, you never cease to amaze me. these mittens are supa dupa fabulous. tell me... what can't you do?! I look forward to seeing you next month ( yes march is on its way! and nicer weather of course!) 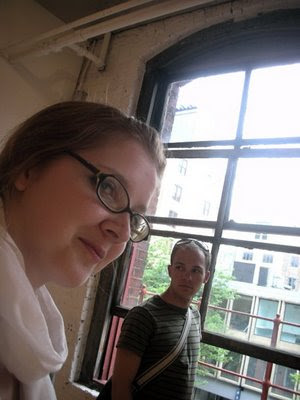 Many blessings and God speed on all of your artistic endeavors!